National Coalition Government of the Union of Burma welcomes any move that challenges the legitimacy of the ruling junta. New Delhi - Although the Burmese government in exile – the National Coalition Government of the Union of Burma – has not signed the credential challenge campaign against the junta's membership in the United Nations launched by other Burmese groups, it said it endorses the idea. Dr. Tint Swe, Information and Public Relations Committee Chairman of NCGUB and Minister at the Prime Minister's Office (west), told Mizzima that though his government has not signed the challenge campaign, it supports the idea and welcomes any move that challenges the legitimacy of the ruling junta. "The UN should not accept the Burmese military regime as a legitimate government of Burma," Dr. Tint Swe said. He pointed out that his government, in keeping with diplomatic relations, is unable to sign the credential challenge campaign letter, but in principle, the NCGUB agrees with any movement that challenges the junta's illegitimate rule. Burmese opposition groups in exile led by a coalition of political organisations – the National Council of the Union of Burma – and supported by various other groups including Burmese Members of Parliament Union (MPU), and International Burmese Monks Organisation or Sasana Moli, had submitted a petition letter to the United Nations urging it to disqualify the junta's membership in the world body. The Burmese groups said the junta has been illegally ruling the country using force and has denied handing over power to the people's elected government. 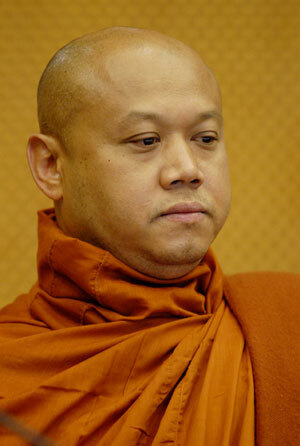 The groups urged the UN to instead recognise its representative as the permanent representative of Burma at the UN. "This movement is necessary because the junta is not the representative of the people of Burma," Tint Swe said. Michele Montas, spokesperson for the UN general secretary during a press conference on Wednesday acknowledged that the UN Secretary General has received the credential challenge letter sent by Burmese opposition groups but said it will reviewed and discussed by the credential committee of the UN at the 63rd UN general assembly meeting on September 16.